A take on the traditional ANZAC biscuit filled with oats, coconut and golden syrup. 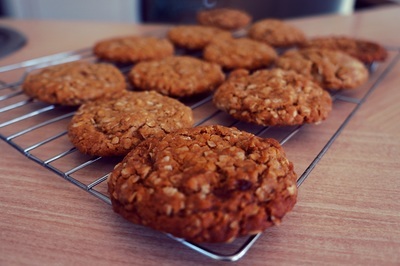 These are the best ANZAC biscuits I have tasted with a beautiful crunchy outside and soft chewy centre. 1.Pre-heat oven to 175 C and line a baking tray with greaseproof paper. Sift the flour in to a bowl. Add sugar, rolled oats and coconut. In a small saucepan, melt the butter. Once melted, add water and golden syrup and combine. Roll in to small balls and place on tray a few cms apart. Bake for 15-20 minutes or until lovely and golden. Allow to cool for 5mins on tray before removing to wire rack to cool completely.